Nestled in a quiet back street of Ashland, NH is the White Mountain Brewing Company. As far as I’m concerned, it might as well be right off the Boston common on Beacon Street because the place is as welcoming as Cheers. Straight from the horse’s mouth, owner Dave Page told me he believes a pub should be a welcoming, friendly place where people can meet, have conversations, and (presumably) bond over his beer, which is pretty tasty stuff. Met a couple of local regulars, met a guy from Bear Island, and met a guy from just outside of Boston. Took Fizzette to White Mountain Brewing and she enjoyed the convivial atmosphere too. Grabbed an IPA and a Beer 30. Shot the breeze. She was sold. Definitely heading back in the future. No clue, didn’t ask. He does seem like the type of person amenable to such. And, the setup is conducive to touring around as it’s a three bay garage plus dining area. 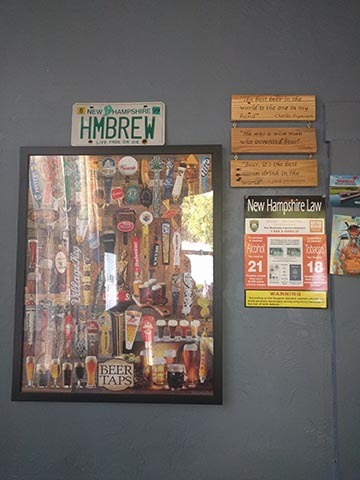 What types of beer does the White Mountain Brewing Company brew? All different types. They have a stout, porter, kolsch, lagers, ales, etc., all with casual names like Old Duffa, Loon’s Eye, Leaf Peepa, and Whatta Corka! 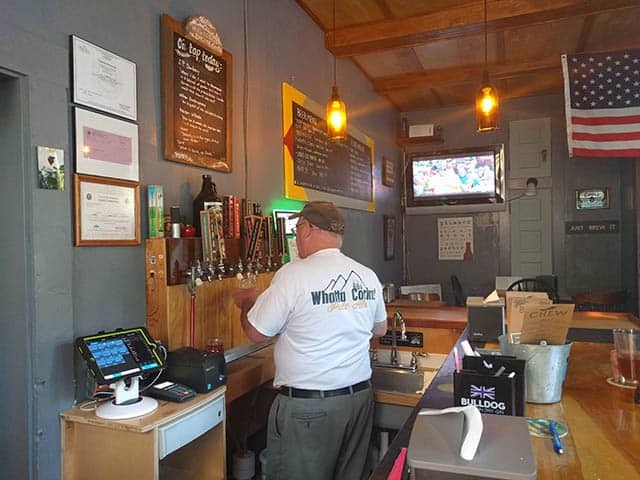 In fact, you can catch bartender Steve wearing a White Mountain Brewing Whatta Corka! t-shirt in the photo (above). Do they have a flagship beer or craft brewing specialty? I don’t think so. They have flagship pricing though. An IPA, chips and salsa, and a Redneck Red ran me about $12. Just stellar. The pricing blows Wolfeboro’s Lone Wolfe Brewery out of the mash. Big difference between Ashland and Wolfeboro though. Yes. T-shirts. Probably mugs, too? 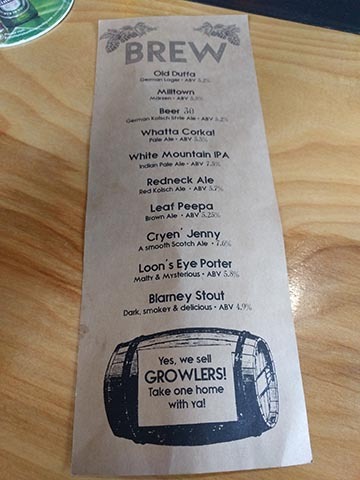 Other White Mountain Brewing Company beer details I should know? Go there? Atmosphere is top notch. Bartender Steve was a super friendly guy. Introduced himself, never forgot my name, real responsive. Also, I believe they are trying to expand the footprint of the pub. I see good things in their future. 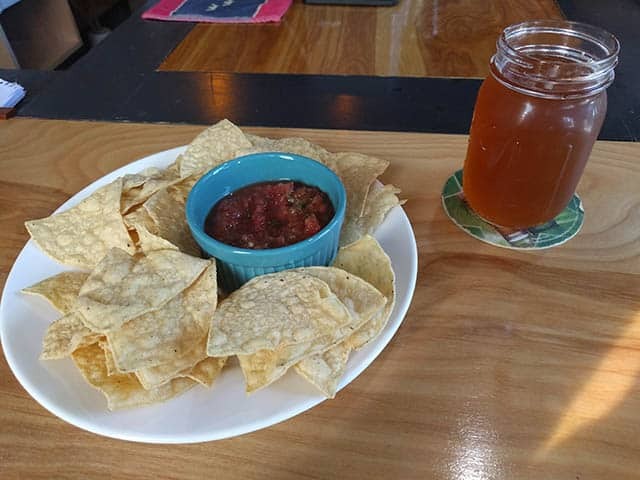 Does White Mountain Brewing offer food? Yes. Dave does double duty hustling out the grub. I ordered the chips and salsa, reasonably priced at #3. They serve chili, burritos, hot dogs, and other small plates. Can’t speak to the other stuff, but the chips and salsa hit the spot. Chips. Salsa. Beer. Triangle of Awesome. Where can I buy White Mountain Brewing beer in stores? You can’t. Not yet at least You can get it a few local pubs though. Interesting notes or nice touches? Parents take note, there is no baby changing station in the bathroom. Love it. Can’t wait to return.